HZS90 concrete mixing station can produce concrete 90 cubic meters per hour, consisting of the host (concrete mixer), batching machine, screw conveyor, hoist, cement tanks, trucks, weighing system and other equipment. HZS90 concrete mixing station, a medium-sized concrete mixing station, which is equipped with JS1500 model dual-axial concrete mixer, PLD2400 batching machine equipment, and belt. The cement, water, liquid admixture of ingredients are electronic scale metering. What’s more, it has the advantage of good quality, high efficiency, accurate weighing, long life and high cost performance. Zhengzhou CamelWay Machinery suggest HZS90 commodity concrete mixing station need prepare at least three 100 tons of cement tanks, but if the user needs, we can also according to customer’s request for additional configuration. Models of concrete mixing station on the market are HZS25, HZS35, HZS50, HZS60. HZS75, HZS90, HZS120, HZS180, and HZS240 concrete mixing plant. Zhengzhou CamelWay Machinery manufacture develops and produces concrete mixer which will satisfy your different requirements. 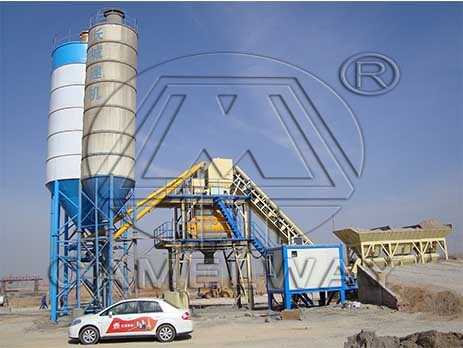 If you want to know more information about the concrete mixing plant or buy it, you can contact us.